You’ve watched Emerson grow through his first year, and today, I had the opportunity to shoot his party. There were balloons, cake, lots of food, swimming and a jumping castle. What a party! In a few days I’ll be shooting a little cake smash with Emerson. Can’t wait! I recently had the opportunity to work with Ian Taylor, a local Blues artist. Ian needed some images for his upcoming CD. We had about 1/2 hour (while Ian was on a break from his ‘real life’ job), a couple speed lights and a concrete wall. Together, it made for a great back drop for some edgy blues portraits. Ian’s CD is out soon. For now, he’s playing many local clubs. Check him out! I can now add “Award Winner” to my résumé…. Early this month one of my photos was selected third place for the Hino Motors Canada Yearly calendar. The Photo was taken for The Delivery Guys – a local family run courier business. 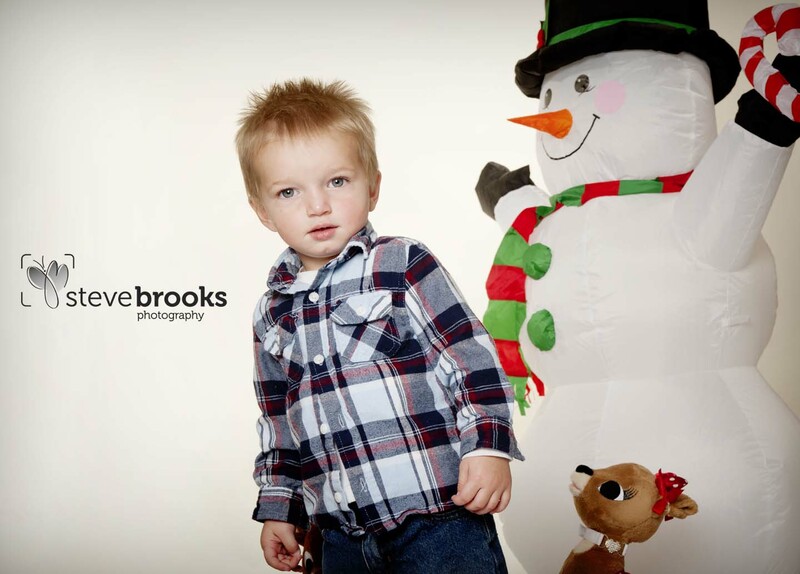 Here is the second half of the holiday portraits! I’d like to send a big thank you to all the Mom’s and Dad’s that stood behind me and jumped, made faces and sang to get the smiles…..
Sam is growing up right before our eyes. We’ve shot Sam as a newborn, at 4 months and now 8 months. He’s growing into quite the little man. This shoot was fun – We decided to take to the great outdoors and visit the Huron Nature Park in Kitchener. It was a great little nature walk, we got some fantastic relaxed pics and best of all…..Sammy loved the camera! The little sock monkey hat was made by Pink N Yellow Butterfly. Because our ‘little ones’ are growing up very quickly, Carey asked our friend Annette to bring her beautiful daughter Ava over for a photo shoot in some of the hats! It was nice to catch up with an old friend and Carey got some great shots to start marketing her products. (Thanks again Annette!) Below are some of the great images we captured of Ava in Carey’s creations (and one of each of our daughters… who wanted to show off their newest hats!). Special mention also goes out to Baby Emerson, who was the first to wear one of Carey’s creations (at only 2 days old!)! We’ll be looking for some more models in the near future for the new styles… if you’re interested, let us know!